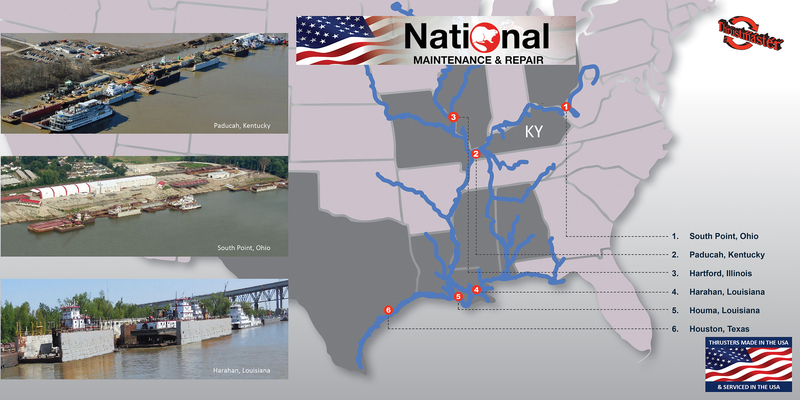 Investing in new capital equipment, such as Z-drives for an inland towboat fleet, may seem like a formidable task. Especially after decades of conventional shaft and rudder propulsion use. Despite the evident operational benefits of Z-Drives – when adopting a new technology for mission critical operations such as propulsion and steering, you want to be sure the manufacturer of your equipment stands by their product and is there to help you succeed. Preferably standing by you in the same country, speaking the same language, with a large supply of spare parts and a team of expertly trained service technicians in your neighborhood ready and on call 24/7. In order to ensure optimum service with minimal response times, Thrustmaster is pleased to announce that we have signed a service agreement with McGinnis Inc. – National Maintenance & Repair. This agreement extends Thrustmaster’s service centers to six locations in the U.S.
McGinnis Inc. – National Maintenance & Repair’s four service centers are strategically located along major US rivers with 24/7 availability to service your fleet when you need them. Their highly experienced service technicians are trained and authorized to provide installation, commissioning, maintenance, repairs and upgrades on Thrustmaster’s propulsion and control products. Thrustmaster’s new capacities enables us to provide a new level of service, with even faster response times to customer requests. With Thrustmaster’s new service sites and 24/7 service hotlines we are available for our customers anytime and anywhere. Thrustmaster’s Z-Drives are inherently robust in nature and do not require a dry dock for servicing. 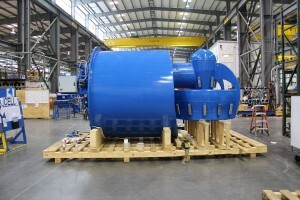 Whenever major maintenance or repair is required, the complete Z-Drive is lifted out of the vessel while the vessel is afloat. A replacement Z-Drive can be dropped in and the boat is back to work within hours. Routine maintenance is limited to periodic replacement of filter elements for the lubricating oil and the steering hydraulic fluid. 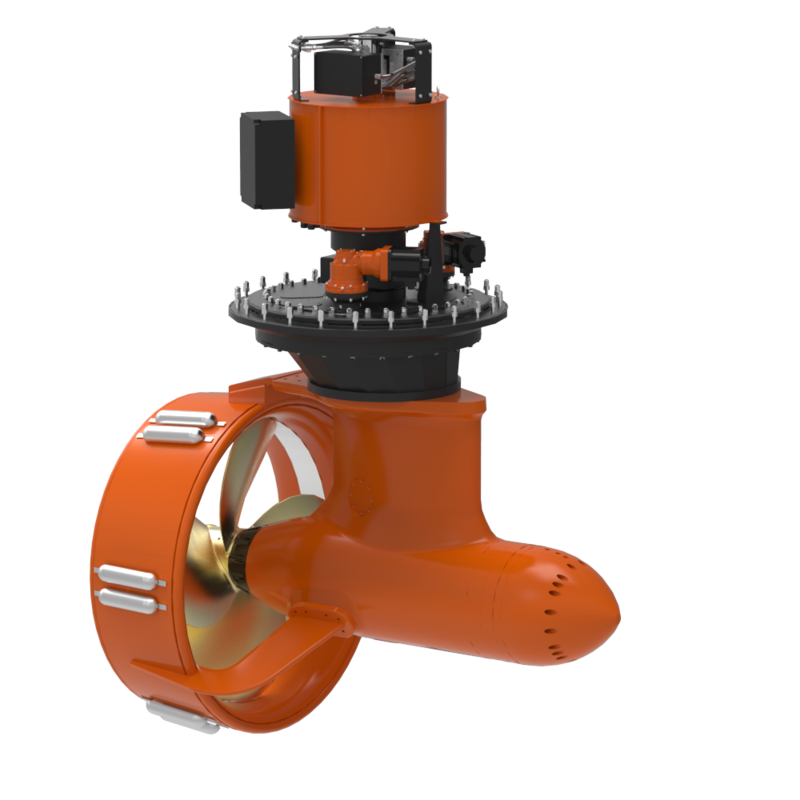 Thrustmaster manufactures a complete line of Z-Drive azimuthing thrusters from 500 HP to 4,000 HP for the inland towboat industry specifically designed to endure the demanding conditions when operating in brown water. Using Z-drives on towboats results in substantially improved fuel efficiency, shorter trip times, decreased maintenance downtime and higher customer satisfaction when compared to traditional shaft and rudder installations. Thrustmaster Z-Drives are designed based on conservative American standards observing ample safety margins. They are built to last even in the harshest operating environment. The units are built at our factory headquarters in Houston, Texas, using American materials, American components and American labor. Each Z-Drive is equipped with a husky stainless steel propeller running in a nozzle with stainless steel internals. The gears and transmission shafts are generously sized and are protected by a quick release coupling at the input shaft of the Z-Drive. This quick release coupling acts as a mechanical fuse whenever the drive line is blocked, for instance when the propeller ingests a log, a tire or a rope. The mechanical fuse can be reset manually after the obstruction is removed out of the propeller.